Odd sticker tag. EDIT: Inspection complete? But upon examination, the tag has ‘K05’ on it. Probably nothing, don’t remember seeing it on previous pokedolls and I found an odd sticker tag on the plush. It’s on the 2nd pic. This isn’t a plush that has bootleg copies of, so I doubt it is and not bothered by the idea it is (I hope it isn’t for obvious financial reasons). But i’m Curious what the sticker mean or says, as I believe it might be a company sticker that a seller might put on an item. But who knows, well looked after though. Pictures will be under the cut. Thank you for any help. EDIT: I can not find anything for K05, apart from hair. But the text is Japanese for inspection complete. I doubt that would be anything with bootlegs. But it is perculiar what that means? Hiya! I have a few things I'm currently on the lookout for and they've become very pricey on ebay so I thought I'd try here. Please note I am in Canada. So it seems the plush and figures have started to hit stores! However, they aren't actually supposed to be there, lol. According to quite a few target employees, these aren't supposed to be released until next month. It's supposed to have it's own display and everything, which a lot haven't gotten to setting up yet. If your target doesn't have them — I'd wait it out — some have them and they're in the back or they're in transit and will be there next week. I went to mine earlier (and called about 5 others) and some have them out due to miscommunication, others are holding them (mine has 10 pikachu in the back, one mewtwo on the rack but none of the others, lol). I got Psyduck and Pikachu for someone who didn't end up wanting them if anyone would like to buy them for retail plus shipping. Mewtwo's head is kinda small but he definitely looks better than the plush, lol. I'll post an up close pic of the plush under the cut. It's that time again! I finished up a few last minute projects, and I'm ready to tackle a new round of commissions! Simplified plush are 3 to 4 inches (sometimes 5 inches) plush made from 2 sided patterns, with no elaborate patterning. They have many flat 1 sided pieces that are used for the more complicated details of the plush. They have plastic safety eyes instead of embroidered eyes. These plushies will only be made of felt. * In addition to the traditional eyes I use I also have Albino, Sparkle, and solid color eyes available. I always go with what works best for the design unless specifically asked. 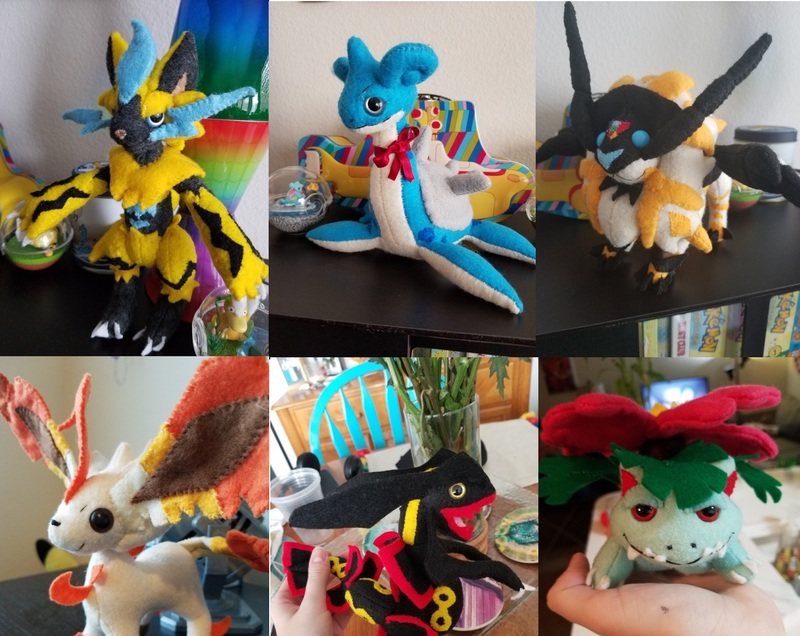 * You can commission 1 plush per slot but may claim as many slots as are available. Please feel free to ask any questions or leave any comments down below! Need a payment plan? I am happy to work with you!